Lochgoilhead; (Scottish Gaelic: 'Ceann Loch Goibhle') is a village, on the Cowal peninsula, in Argyll and Bute, Scottish Highlands. It is located within the Loch Lomond and The Trossachs National Park and is widely considered to be one of the most beautiful areas in Argyll and in Scotland as a whole. The village is surrounded by several Corbetts in the Arrochar Alps (Lists of mountains and hills in the British Isles), including Benn Donich, The Brack and Cnoc Coinnich and local waterways are the River Goil and the Donich Water. Controversial planning permission was recently granted for a hydro scheme on the Donich Water which supplies the village water supply. The area has been inhabited for over 10,000 years, with the original name for the area being ‘Kil nam brathairan’ from the Gaelic for ‘Church of the brothers’. There are Neolithic remains in the area, including nearby cup marks and a well-preserved corn kiln. 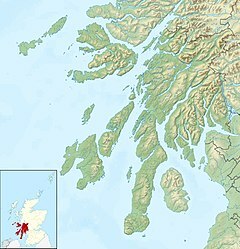 The area is associated with the history of Clan Campbell, who drove the Lamonts from the area in the fourteenth century. Lochgoilhead used to be an important stop on the route between Glasgow and Inverary, as travellers would arrive by boat and continue by coach to St Catherine’s, where they would board a second boat to cross Loch Fyne. Lochgoilhead is situated in the Cowal Peninsula and access to the village is either via the A83 with a turning off the ‘Rest and be Thankful’, or the A815 from Dunoon. Both roads are single track. Travel times from Glasgow (fifty miles to the south east) are approximately 90 minutes. The village has a population of about 400, with around a third of the houses being holiday rental properties or second homes. There is a large holiday village run by Drimsynie estates which nearly doubles the population of Lochgoilhead in high season. Employment in the area is largely related to agriculture, forestry and tourism, with rates of unemployment at approximately the national average. Rates of self-employment are twice the Scottish average. The village has a Post Office/Shop and a small Costcutter supermarket. There is a church, a village hall which hosts a number of community events, a primary school and a doctor’s surgery. Drinks, meals and accommodation are available at the Goil Inn and Shore Inn. The area has many associations with outdoor activities, including the National Activity Centre for the Scouting Association and the Ardroy Outdoor Centre. There are many famous local walks including the Donich Circular and parts of the Cowal way (a view of Lochgoilhead can be seen on the home page for the Cowal Way website). The area is also incredibly rich in wildlife; Red squirrel, pine marten, otters, red deer and badgers are common, as well as seals and porpoises in the loch and eagles and buzzards on the hills. Wildcats used to be common in the area but may now be extinct locally. There are a number of books about local history available, including ‘Loch Goil – A slice out of paradise’ (the name is a quote from the famous mountaineer WH Murray), ‘Loch Goil – looking back’ by Iain Smart and Rod/Tricia Philips, and ‘The Lochgoil and Lochlong Steamboat Company’ by Iain Smart. There is a community website and the local newspaper ‘The Wee Goil’ is published monthly. Parts of the film “From Russia with Love” were filmed locally, and Sean Connery stayed at the Goil Inn (then the Lochgoilhead Hotel). “Restless Natives” also shows scenes near Lochgoilhead. MOD Noise Range - This range is operated on behalf of the MOD by QinetiQ, and includes a floating lab located in the middle of the loch, between The Lodge and Drimsynie Hotel. Until recently the lab was only occupied during trials, but as of late 2015 substantial new equipment was installed and the lab is now permanently occupied and frequently in use. The volume of MOD traffic on the loch has increased substantially over the last year - submarines and frigates have in fact been spotted/photographed on the loch recently. Sound reports taken on the shore near the lab when it is in use have shown LFN of up to 50db. Corrow Farm - This farm houses the Estate Office for Drimsynie Hotel and the Head Office for Drimsynie Construction. It is also a working farm, using new generating equipment which run almost constantly and generates LFN of up to 60db. Waste Water Treatment Works - This plant, operated by ScottishWater, is located at the edge of the village where it expels into the Donich River. When the plant pumps/turbines are in operation LFN of up to 60db has been recorded. An outbreak of non-pneumonic legionellosis due to Legionella micdadei in 1988 became known as Lochgoilhead fever (similar to Pontiac fever), the source of which was traced to a local hotel/spa. Two more minor outbreaks have occurred since - the most recent being in 2006, affecting only one resident and two visitors - following use the facilities at the same hotel/spa. Prof David Newth FRSE, zoologist, retired here in 1981 and died here in 1988. ^ "Loch Lomond National Park Website". Archived from the original on 24 January 2011. ^ "EPlanning Site for Loch Lomond National Park". ^ Loch Goil - a Slice out of Paradise. Akros Print. 2004. ISBN 978-0-9540825-1-2. ^ Loch Goil - Looking Back. Lochgoil Publishing. 2006. ISBN 978-0-9554495-0-5. ^ "Lochgoilhead page on National Park Website". Archived from the original on 24 January 2011. Retrieved 10 November 2014. ^ "Information on Drimsynie Estate". Retrieved 10 November 2014. ^ "Lochgoilhead information on National Park Website". Archived from the original on 24 January 2011. Retrieved 10 November 2014. ^ "Donich Website - Local Wildlife". Retrieved 10 November 2014. ^ "Donich Website - Pine Martens". Donich Website - Deer. ^ "Films shot in Lochgoilhead". Retrieved 10 November 2014. Wikimedia Commons has media related to Lochgoilhead.